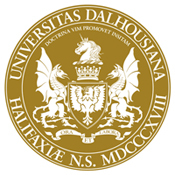 Dalhousie has used the eagle and shield, taken from the university’s seal, as the basis for its logo since 1987. Dalhousie’s primary colours are black and gold, taken from the jerseys originally worn by Dalhousie’s rugby team. "Ora et Labora" ("Pray and Work"). The Dalhousie seal is based on the heraldic achievement — commonly called “Coat of Arms” — of the Ramsay family of Scotland. The Rt. Hon. George Ramsay, Lieutenant-Governor of Nova Scotia, founded Dalhousie University in 1818. Though the Ramsay seal features a griffon (half lion, half dragon) and greyhound, the Dalhousie seal instead has two dragons supporting the eagle-adorned shield. In 1950, the Dalhousie Board of Governors changed the colour of the shield from silver to gold to better match the university’s colours. The seal is displayed at convocation and can be seen engraved on the lobby floor in the Henry Hicks Academic and Administration Building.